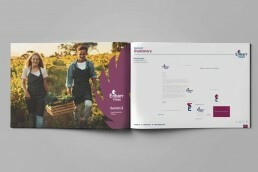 While all brand design experts follow a similar process when it comes to developing new brands, a good brand design agency will have their own way of working – I thought it would be interesting to give you an insight into how I develop a new brand…which is very much my own individual approach. 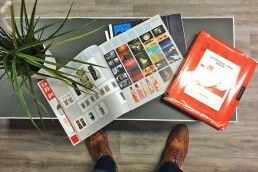 Most designers agree that the client brief at the beginning of any brand design agency project is arguably the most important factor in the ‘pre-development’ stage. If the brief is incomplete, inconsistent or in some cases not there at all, as designers we are operating totally in the dark, and in most cases, are unable to deliver what the client is looking for (how could we with no direction!). So before anything starts, I insist on a brand design from the client. Some clients like to give a very detailed design brief, for others, it can be very short one with bare bones information included. However, a brief is a brief. 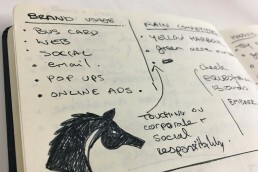 In order to really understand the client’s market, positioning and customers (existing & potential), we undertake a 2-3 hour workshop with our design team and client to explore and challenge everything about their business and their brand positioning……..before we ever put pen to paper. From this workshop, we confirm the client’s offering, brand positioning and market positioning, before moving on to the exciting stage of brand development. To illustrate my individual approach, I thought it would be useful to bring you through the entire process used recently for a new client, Catherine Collins who approached our brand design agency for a new brand.  This project included a detailed brand workshop, brand name review, brand development and website development (including SEO strategy). Catherine Collins provides extensive support to her clients by empowering them to unblock and solve any issues within their business, as well as helping them to identify business growth opportunities. In Catherine’s works, she helps her clients maximise their business opportunities in a environment that is challenging yet respectful. From our detailed brand workshop, we established exactly what Catherine wanted to achieve through a strong brand name, brand visual and business strategy. Taking all this information into account, we then set to the task of choosing a brand name for the business. Catherine’s business positioning is very much within the rural and agri sector, driven by her love of the countryside and horses in particular. 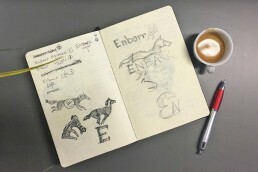 With that in mind, Catherine was very eager to explore the use of the name ‘Enbarr’ (Enbarr is the Irish mythological horse Énbarr of Manannán which could traverse land and sea). We liked the name and felt it reflected her business, but felt it was a little weak in isolation. We all felt the use of the word ‘consulting’ was somewhat overused and vague. 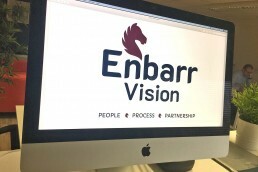 After much discussion, the selection was narrowed down to three choice – Enbarr life, Enbarr Vision and Enbarr Advance. At this point, the project moves from the wider team back to me and my design team. When creating the brand designs, I ensured we kept the three alternate names in mind and decided to make three unique designs, one per name. The second most crucial part of designing any brand, after the briefing stage, is the sketch stage. It is imperative that this stage is not bypassed as sometimes what you have in your head from the initial client briefing might not work when sketched out. Normally, I have a vision of the brand in mind before I even leave the first meeting, which is something that comes with experience (and skill of course!). Depending on how the exploration stage goes, I can either go through multiple pages of logo idea sketches, and sometimes only one or two pages will do. In the case of Enbarr, it was only a few pages, as I had a clear vision of what the end result should reflect. Having the detailed brand workshop really helps at this stage too. Reading printed resource material is also essential in my process. This is purely to get inspired by world brands, designs and layouts. It is quite a casual process where I flick through the pages of the material. Personally, I love the slightly older design books and references from the mid 90’s to late 2000’s. I love seeing how brands from 2004 look now for example and if they stood the test of time. Once I’m happy with where I got to at the sketch stage, it is over to the Apple Mac. If I want to use bespoke icon illustration for the brand, I use our scanner to bring the artwork in. If not, I start by typing out the brand name in Adobe illustrator and begin picking font styles that I think will complement the brand. I then start the construction of a particular icon that I think has potential, in this case, the horse icon and work from there. 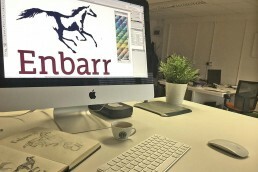 From the initial sketches, the brand starts to take shape. Sometimes when in the app, I can find I begin new directions or adjustments from my initial sketches. This happens in a very organic way. Once I have my concepts developed, I start bringing them into a presentation format. We have recently honed and developed a video-based presentation format for brands which we find engages the client, and leads them seamlessly from the initial concept idea through to brand application. Post presentation, depending on initial feedback, the finalisation of the brand takes place. Normally, we expect there to be some tweaks but the majority of the time a client chooses a brand as presented and stays with it. I then create all the relevant versions of the brand, the black and white, revered versions and compile them into an in-depth and comprehensive brand identity guide manual. This manual is very important for any new brand going forward. It ensures that their brand stays consistent no matter what literature or livery it may be applied to. In essence, the business card colours should look the same as the van colours and the website colours and so forth. I love developing brands! For me, the real kick is when the client sees the brand and is delighted with the result; another happy client of our brand design agency! I’d love to hear what you think of my brand design process. If you have any queries, or are thinking of starting a new branding project, I’d be delighted to meet and discuss further. Just drop me a line below!